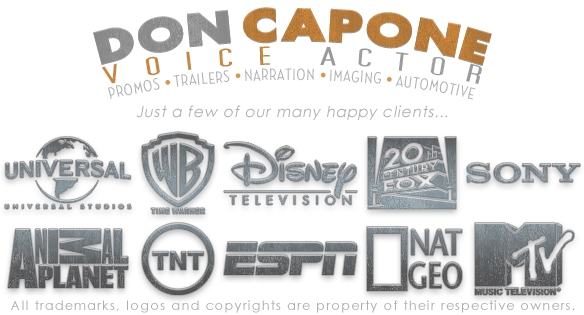 Commercial Voice Over and Voice Talent Services with professional Voice Overs from American Voice Actor Don Capone. If you need commercial voice overs for radio commercials, tv commercials, movie trailer voice overs, radio voice imaging, documentary voice over, narration, anime voice overs, cartoon voice overs and character voice acting... then your in the right place. We have done thousands of voice over jobs in our 30+ years in the entertainment industry.